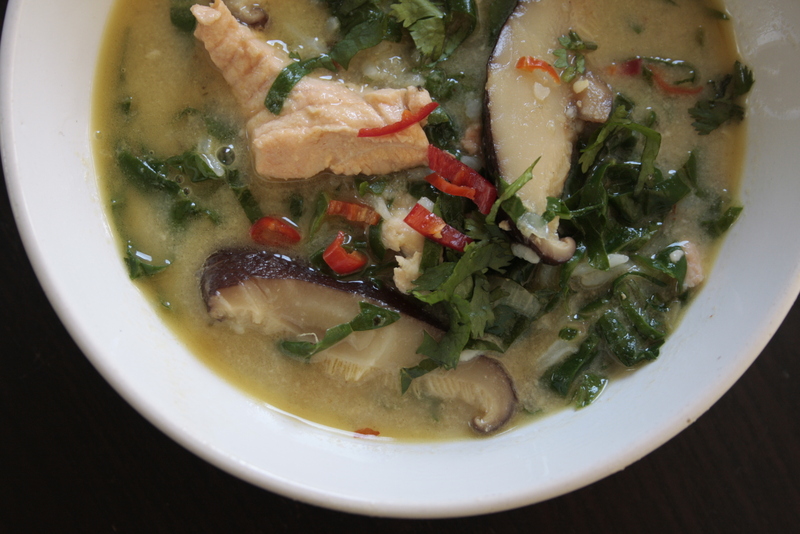 asian lake fish soup | eating with S.O.L.E. When you fillet a fish you (I’ve heard always) end up with a couple oz’s of fish meat that can be easily scraped of the bones this is what i used to add flaky fish bits to the soup. I reserved a total of just shy of maybe 2 cups for this purpose from the night before. Soak in boiling water with a lid about 2 cups of dried mushrooms, allow to soak for at least 1 hour before slicing, de-steming, and straining. 2″ of fresh garlic and coarsely chopped all in a light veggie or nut oil. Once the onion is cooked add in the above mentioned 8 or so cups of fish stock. Bring to a hearty boil and allow to cook for at least an hour, before pureeing the stock until all the veggies are smooth and incorporated into a really nice soup stock. and 2 cups of fresh uncooked fish fillet bits. Gently cook until fish in done, then serve quickly with a garnish of freshly minced hot peppers and cilantro. Now this a soup worth waiting 12 hours for!